Federal Reserve chair Janet Yellen said in earlly May that she expects to keep short-term borrowing rates low for a "considerable time." She's continuing to set a target of seeing healthy employment numbers and inflation around 2 percent before raising short-term rates above their nearly 0 percent levels. While short-term rates will remain low, long-term rates are another story. The Fed is continuing to taper -- to reduce its purchases of U.S. government bonds. The Fed is expected to hold its existing bond portfolio for quite some time. Still, as it stops purchasing new bonds, it takes a very deep-pocketed buyer out of that market. That creates conditions wherein long-term rates will be much more likely to rise. And with the Fed expected to complete its taper this year, long-term rates may rise soon. 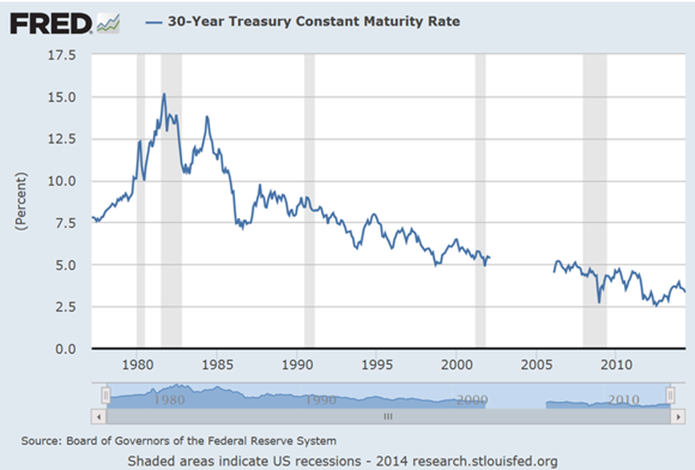 The chart below shows the history of 30-year Treasury bond interest rates for the past few decades. While nobody is expecting rates to skyrocket to their 15 percent peak, note that before the recent recession and the Fed's long-term bond-buying spree, rates were around 5 percent or so. It's reasonable to anticipate that absent the Fed's incremental buying pressure holding down long-term rates, those rates may revisit that 5 percent level once the Fed stops buying. stlouisfed.orgChart from the Federal Reserve Bank of St. Louis, as of May 17. With 30-year interest rates currently around 3.4 percent, that suggests long-term rates may rise as much as 1.5 percentage points or so over the next few months. In the grand scheme of things, that may not sound like much, but if you own long-term bonds, that kind of rise may be quite painful indeed. Time to maturity -- the longer until the bond matures, the larger its modified duration. Coupon interest rate -- the lower a bond's coupon rate, the larger its modified duration. Yield to maturity -- the lower a bond's yield to maturity, the larger its modified duration. Since coupon rates and current yield to maturity are typically lower for higher-quality bonds, this means that high-quality, long-term bonds have the highest modified duration. Thus, almost ironically, the bonds that have the furthest to fall as interest rates rise are the long-term versions of bonds that are typically viewed as the "safest," such as Treasury bonds. %VIRTUAL-article-sponsoredlinks%Indeed, the 30-year Treasury bonds issued on May 15 have a modified duration of around 18.7. Or in other words, if interest rates rise one percentage point in the near future, the market price of those bonds will drop around 18.7 percent. Of course, as long as Uncle Sam doesn't default, an investor is still expected to get back the bond's full face value at maturity and all expected interest payments along the way. Still, that's a substantial drop in value for a so-called "safe" asset for a fairly small move in rates. Shorten the time-to-maturity of your bonds. Shorter-term bonds have lower modified durations, but the trade-off is that you typically receive a lower interest rate for shorter-term bonds. For instance, while 30-year Treasury bonds currently offer around 3.4 percent interest, 10-year Treasury bonds only offer around 2.5 percent. Buy higher-yield bonds. Higher-yielding bonds have lower modified durations, but the trade-off is that those bonds generally carry a higher risk of default. Still, there's a whole range of available risk levels between government-backed bonds and junk-rated bonds. Generally speaking, bond ratings of BBB or better are considered investment grade and carry a fairly low default risk. Tough it out. As long as you're receiving sufficient income from your bond coupons to meet your needs and you remain confident that the issuer will repay its obligations, you can simply hold on and wait it out. As bonds get closer to maturity, their modified durations shrink. At maturity, as long as the issuer doesn't default, you'll still get the face value of the bond back. When it comes to investing in bonds, the No. 1 rule is "Don't fight the Fed." 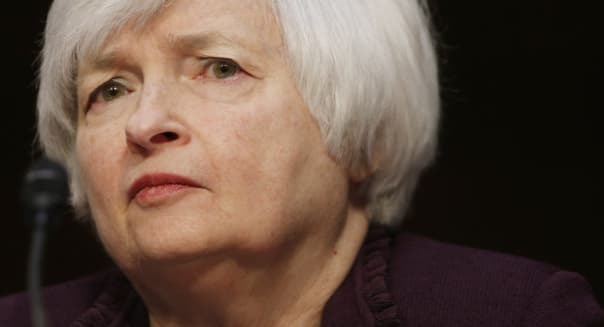 While Fed Chair Yellen has clearly indicated her plan to keep short-term rates low for quite some time, all indications are that she plans to continue winding the Fed's long-term bond purchases. That means that higher long-term interest rates are likely. Invest accordingly.